Malawai Mzuzu AA Women's coffee blend is from approximately 200 small scale farmers and made up of 80% Nyika Catimore and 20% Geisha varieties from farms between 4,000 ft. and 6,200 ft. 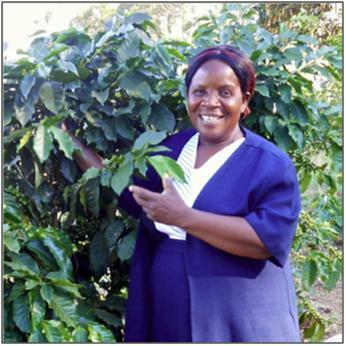 Altogether, the Malawi Mazuzu Cooperative is made up of approximately 4,000 small scale farmers spanning over five coffee districts. The developed cooperatives that supply most of the coffees for the Mzuzu Coffee Planters Union are all northern districts of Malawi from Mzimba upwards. There are also more cooperatives developing in the central regions of the country around Dedza. All the coffees are processed by the fully washed method and then sun dried. They are stored in bags in a cool well ventilated area for at least two weeks and often over twelve weeks, prior to being sent to the Mzuzu Coffee Planters Cooperative Union dry mill for processing. Misuku Hills, the most northern district is located close to Songwe River which forms a natural boundary between Malawi and Tanzania. It is made up of 4 parallel ridges and plateau ranging between 1,700 - 2,000 meters. The area is almost 320km away from Mzuzu City, the Commercial and Administrative headquarters for Northern Malawi. The soils for coffee growing areas are Dystic Nitosols found in the sloping and convex narrow ridges and Humid Nitosols found in the lower valley slopes. Maximum temperature recorded since 1983 was 21.9 degrees Celcius in November and absolute minimum 9.9 degrees Celsius in June at Mwalingo, with an altitude of 1600m above sea level. The annual rainfall ranges from 1500mm to 2000mm and falls between November to April with continued showers up to June / July. Large amount of cloud cover between November and July delay production of new canopy, early season flowering and fruit drop. Poka Hills,located in the eastern part of Nyika National Park. The area is dominated by high Nyika Plateau, which rises to 2500m above sea level. Coffee is generally grown in these areas ranging from 1200m t 2500m above sea level. The soils of this escarpment are the best in the Coffee growing areas of the North. These are formed on the Karros beds and are as acidic as those formed on the basement due to natural leaching. The mean annual temperature ranges between 16 - 19 degrees Celsius with a mean monthly range of about 7 degrees Celsius, in July the coldest month and November which is the hottest month. Viphya North occupies part of North Viphya Plateau separated from Nkhata Bay Highlands by the deep valley of Lizunkhumi River. The general altitude ranges between 1,200m and 1,500m. In some places this rises to 1800m above sea level. It is located 80km from Mzuzu City. The soils are deep and are acidic red clays or clay loams/ sand clays, Eutric Nitosols with moderate drainage. The annual rainfall ranges between 1500mm and 1800mm and higher rainfall occurs in the higher parts of the surrounding Uzumala Reserve. The mean annual temperature ranges between 15 and 18 degrees Celsius. The mean monthly range is about 7 degrees Celsius, with July being the coldest month and November being the hottest month. Nkhata Bay highlands includes localities to the South West and South East of Mzuzu City on the Southern end of Viphya Plateau. The altitude for this area range between 950m to 1300m raising to 2000m above sea level in other areas. Mzuzu City lies on a saddle at 1280m between the North and South Viphya Plateau. Rainfall can occur at any time of the year and temperatures in cold season (June - August) can fall to freezing point. The annual rainfall range is between 1300 to 2300mm while minimum temperatures recorded at Mzuzu Airport, altitude 1255m range from 0 degrees Celsius in June /July to 32.7 degrees Celsius in October. These temperatures have given rise to "hot and Cold" symptoms on coffee bushes exposed to cold winds and lacking shade. The coffee farmers have the necessary technologies to make coffee survive in this environment. South East Mzimba is located on the Southern part of South Viphya Plateau. It is 190km away from Mzuzu City. It occupies the upper valley of Luwelezi, Rukuru and Rupashe River systems. The general altitude ranges between 1200m and 1300m with some areas rising to 1700m above sea level. Coffee growing in this area is confined to soils that are deep, and fine textured, dusty and clays and clay loams formed from the cordorite gneisses. Rainfall is high in Msese and Kapita areas where coffee growing is concentrated. The annual rainfall ranges between 900 and 1400mm. This lot is traceable to the women farmers of Mzuzu Coffee Planters Cooperative Union. The local language name for this lot is Ama widu asele mu ulimi wa khofi ndi nthazi, meaning “Our women have entered the coffee business with fire and vigor!” This name originates from the Tonga spoken in the Nkhatabay Highlands.